fantasy product, said it lost $2 million when Woods secured his first major victory in more than a decade. The Westgate Las Vegas SuperBook lost nearly $100,000, its worst result ever for the Masters, and William Hill U.S. lost “seven figures.” “It’s great to see Tiger back,” said Nick Bogdanovich, director of trading at William Hill U.S. “It’s a painful day for William Hill — our biggest golf loss ever — but a great day for golf.” Sunday’s losses, though bad for many, likely won’t come close to offsetting the profits amassed during Woods’s down years. Despite a decade of struggles both on and off the course, Woods remained a favorite among the golf-betting public. It was common for Woods to be the most popular golfer at a tournament, regardless of how long the odds. “We are still doing well overall with wagers involving Tiger,” Jeff Sherman, vice president of risk at Westgate SuperBook, said in an email. At FanDuel’s sports book, 21 percent of the futures bets placed on the Masters were on Woods to win it all, a slanted total that resulted in a net loss of more than $1 million. 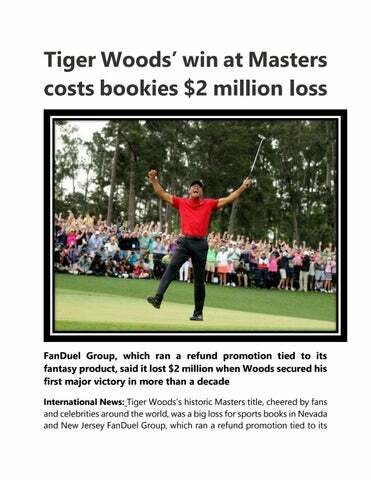 The company also ran a promotion for its biggest Masters fantasy contest, where it promised to refund all entries if Woods won the tournament. That resulted in another $1 million paid back to FanDuel customers. ‘Seven Figures’ William Hill found itself in a similar spot. A few days before the first round, a William Hill bettor in Nevada placed an $85,000 wager on Woods at 14to-1 odds. The bet, which paid out $1.2 million, was the biggest liability on a single golf wager in William Hill’s seven-year history taking bets in the U.S. After all bets were paid out, William Hill was out “seven figures,” according to spokesman Michael Grodsky….